Hey people! I hope all of you are doing well and enjoying the summer weather! I have, once again, been rather derelict in my writing duties over the last month. I certainly hope to do better, and I appreciate everyone hanging in there with me. Thanks to Duquesner JOHN BERTA, I have a treat for you. A few weeks ago, John forwarded several pictures to me to share with you. 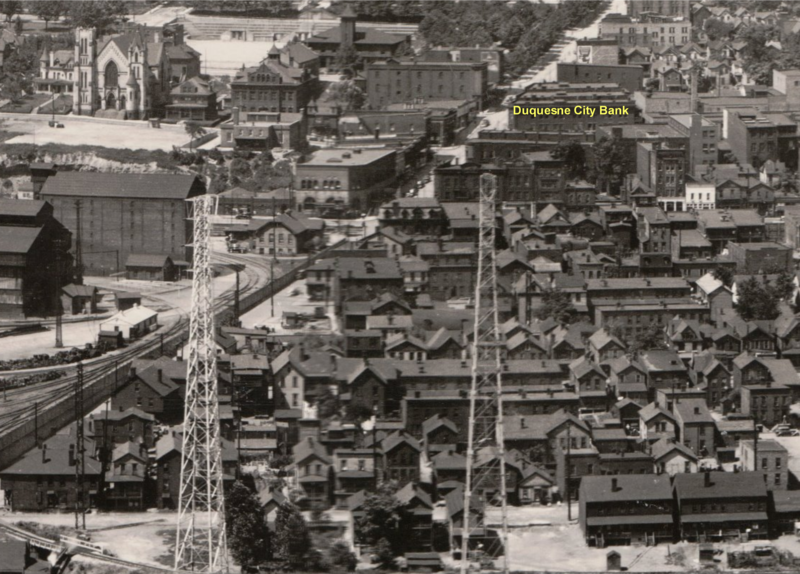 One of those pictures was a magnificent panoramic view of Duquesne that was taken in 1938. Although some of you may have seen this photograph before, the quality of the one that John sent to me was so great, that I was able to dissect it into several smaller sections to try to identify some of the buildings, structures and areas. Unfortunately, I wasn’t able to identify many of the items and decided to ask for your help. Due to the size of the images, it may take longer than normal for the pictures to load, but be patient, they’re worth the wait! As my daughter’s were growing up, there was a series of books that were published called “Where’s Waldo?” The point of the book was to try to find this tiny cartoon character in a rather cluttered picture. 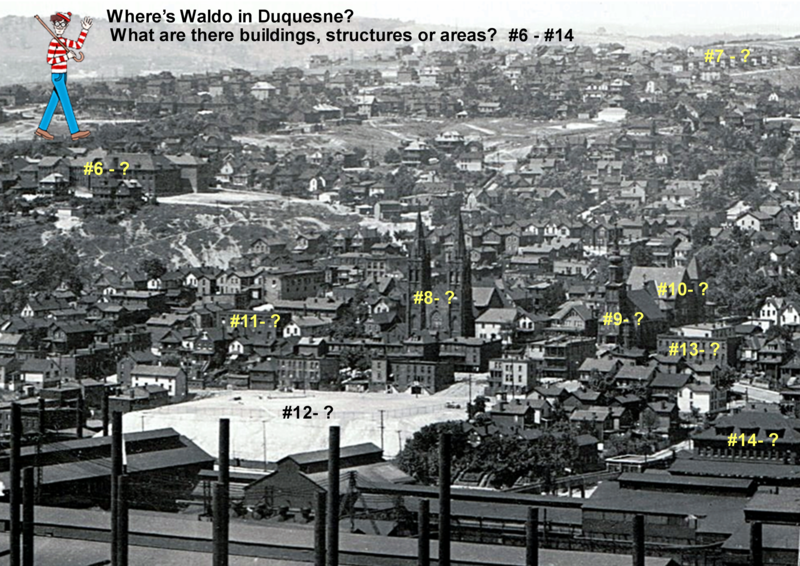 Well, Waldo’s looking for his hunky roots and has visited Duquesne, so can you help him (and me of course) identify 20 Duquesne sites? If you can help, please write a comment and share your Duquesne expertise with all of us! If you click on the image, you should be able to see a larger version of the panoramic view. 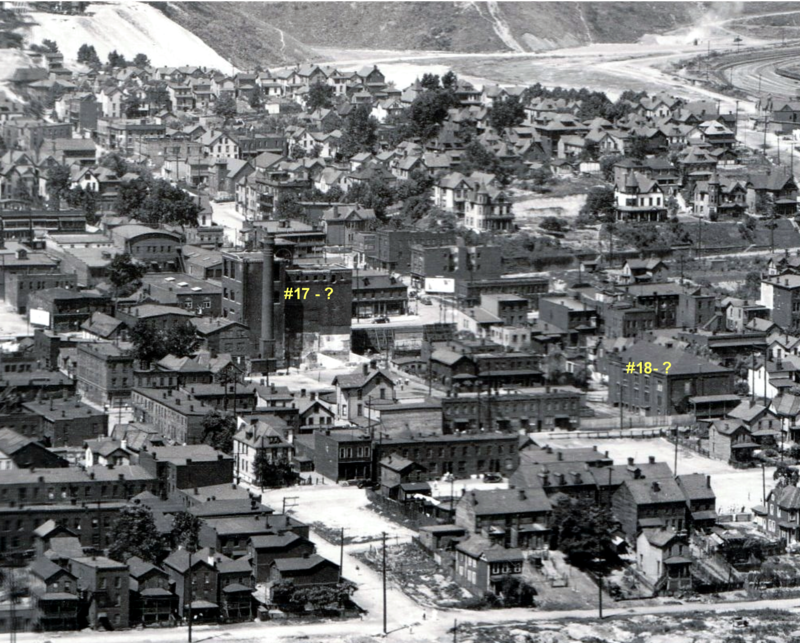 The following five photos show various portions of Duquesne. Some buildings are easily identified, others, not so much. In the first photo, I was surprised to know that my father’s business, located directly across from the Holy Name Rectory on South 1st Street, didn’t exist in 1938. It appears to be a parking lot, which it eventually returned to! If you can identify any of the the “# – ?” items, please comment! Again, to see a large version of any photo, just click on the image. Lastly, I was AMAZED at the size of the area and the number of homes that were located “below the tracks!” By the time I was born, or at least within the time I can recall, this area no longer existed. If anyone has any insight into this area or can identify any of the buildings, please comment and share with us. 84 Responses to Where’s Waldo in Duquesne?? From the panoramic can you blow up the other end by the bridges? Let’s see what’s on the Crawford Estate. Oh wait…the first bridge is the Riverton Bridge/McKeesport Duquesne Bridge….and the next one is the one from National Tube Mill in McKeesport. Somewhere in this thread Tom the Barber was mentioned. I have been getting my haircuts from Tom for around 50 years. I don’t have as much to cut now but he still charges me full price LOL! Anyone wanting to see Tom be aware he now takes Thursdays off now in addition to Sunday and Monday. for 2 years to Serra HS. Does anybody have any full-face photo(s) of the Plaza Theater; perhaps, with the candy (drug?) store to its left? How “bout Stone’s Hardware, across the street? Seeing these wonderful, large photos, with such sweeping views of our Duquesne, started me remembering some of the smaller views around town, too. Woody’s Drug Store was next to the Plaza theater. Back in the early 50’s, I would stop in after my Scout meeting to have an ice cream soda for 10 cents. I lived in West Mifflin, the bus stop was in front of Woody’s. This was the days of ” Duquesne Motor coach lines ” G. C. Murphy was across the street . Three or four stories above Murphy’s was the Royal Pharmaceutical co. My Aunt Mary worked there till they went out of business. My name is angie and I lived on South Duquesne Ave.across the street from the steel mill entrance. I watched my Dad and his friends as they walked the steps up to the bridge to go into the mill. They were all clean when they went in but when they came out, well you know! They worked the 7 to 3 shift. I played my piano-accordion for the workers as they waited on our back steps to go into work. I mostly practiced outside. I loved those hardworking men. My Dads name was Dominic Cifaldi. A most generous and loving man to all. Was he related to Joseph Cifaldi? Great pictures and so many replies. This was a good one, Jim. I don’t think many of us have ever looked at Duquesne from these points. I remember walking from Holy Name School to the Jr. High on Sixth Street for Home Ec. and the boys went to DHS for shop. Wouldn’t #1 be Duquesne Jr. High School and #4 be Libengood School. We had our metal shop and wood shop classes at Libengood School just across the street from the Jr. High. That’s the way I figured it, too, Ray, having attended metal shop where you did. #5 is the water tank. The top of Doney St was called Tank hill. Directly across from the Tank lived “Cheesy”Kraft,& opposite lived Britton Watts DHS 1953.”Cheesy”was 1or2years behind us. Larry Curran lived up there but Dave Maurer lived in the last house going up Kennedy Ave; on the right. His house faced the road going up to St.JO’s cemetery. Kennedy’s brick pavement ended & West Mifflin’s asphalt began starting at Kopriver’s Flowers corner & going past Jim Volk’s THOMAS ST.
“Cheesy Kraft graduated in ’54 with me. He was a part of the Doney St crowd along with Lee and Bob Mowry. Cheesy also owned the first Edsel convertible I laid eyes on. Do you remember when they painted the water tower silver? I think it was approx. 1950. What a great change it made. It seems to me that they added some verbage like “the Dukes”, or Duquesne but I can’t be sure about that. Jim, is this before your Dad’s gas station? #1 is the back of the JR.HIGH SCHOOL on 6th St. #2 (the Tower which looks like a part of it on the right) is the Libengood Elementary School which faced the Jr.High partly. To the left of Libengood can be seen the roof of the Kennedy Elementary School which was closed circa;1940 & was torn down in the 60s. It was rented in 1948 to approx 1951, as a warehouse. (thats another story). Barry, Kennedy was gone long before 60’s. I moved from Auriles St in 1955 and the playground was already built on the location of Kennedy Elementary before that. I spent from Kindergarten thru 9th at the Duquesne Elem/Jr high location. Janie: You babysat for my cousin Fred who is 2 years older than me. My family moved to 3 houses from the Jr.High in 1948 & Kennedy School was closed then.We played on the steps all year long. torn down in the 50’s after its short stint as a warehouse. (old folks should proof-read). I must confess about the pictures I sent you. I recieved them from my brother-in-law Frank Schoderbek. He came across them while helping out at the Mifflin Twp. Historic Society. He deserves all the credit. #3 is Holy Trinity School. #8 is Holy Trinity R.C. Church. #9 is Sts. Peter And Paul Greek Catholic Church. #10 looks like a church and may have been at one time but I think it was the C.I.O. hall. Who owns the large turreted homes on North 1st St just north of downtown but South of the circle where 1st, 2nd, and 3rd meet? These are sizeable homes that overlook the mills and rail yards so they most likely belong to some of the hierarchy. Another interesting observation: Does anyone remember seeing the river’s water level being so low? It IS July, but I never remember seeing the level be so low. It could be that the Tygart Dam in Grafton, WV, was just completed that year (’38) and had not yet begun to supply its water, collected from the snow melt on the west side of the Alleghanies, here in Elkins, WV. Once the lake was full, the mighty muddy Mon’ was navigable, mainly for coal barges, all the way up river to Fairmont, WW, where the Tygart Valley river meets the West Fork River to form the Monongahela. In addition to “Where’s Waldo”…where’s Kennywood? Maybe it’s my eyes, but in 1938 there should be some signs of it. I think I spotted the Crawford Estate on the panoramic view. It’s really hard to find. Just trace back down Center St from Crawford Elementary. Great pictures. Thank you John Berta and Jim for sharing and doing what you have to do to enlarge them and post them in your blog. Really enjoyed them! You can see the Jack Rabbit, on the far right side of the panoramic. Click on it. Thank you, Tom – I see it now. I may be wrong, but I still think what you are seeing is the RACER; compare it with a present day Google map image. From the angle of the photo, the Jack Rabbit is to the left of that, hidden by trees…. From the date on the picture and judging from the angle of the shadows, the picture was taken late morning July 4th 1938. It is not surprising that there are few cars/trucks on the road. Most families didn’t own two or three of them in 1938. Where are the people ? I have been able to locate only eight, six on the street between Hamilton and Grant below First St. and two on Hamilton. Did every one sleep-in for the holiday, or was there actually something worth watching on TV back then ? …..Wait……TV wasn’t invented yet !!!! So maybe they all went to Kennywood. I’ll bet you couldn’t find a spot anywhere to lay your towel at the Starlight Pool, which you can’t see either…. LOL! Really cool information Lou! I would have thought it was always a holiday and a day off. Who’d-a-thunk!?! Why did no one catch this and reply? Of COURSE, you can see the bath house of the pool, it’s just way over on the right of the panoramic shot; you can’t actually see the pool because the RACER is blocking it from that angle, but I do think I see Bob Chermonitz standing up on the Racer…..Again, you gotta know what you want to look for and where to look for it! LOL! Well Bob, I can’t even find a moving train in those pix. The lack of pedestrians is definitely odd, even for the 4th of July. Knowing where to looking at the 2nd photo (6-14), I can see the house (built in ’28) my mother still lives in on Maryland Ave. Waldo is standing in a open field – Burns Heights was not yet built in ’38; it’s an empty lot again, but there are plans for a residential plan on the site. The building with a white roof directly under the word “buildings” was Taper’s Butcher Shop, recently demolished. By the way, if he had a time machine, Jim’s dad, Steve Volk, could have taken the panoramic photo from the back of the parking lot at Eastland. According to a 1925 map of Duquesne, #8 is Holy Trinity R.C. Church (Slavish), #9 St. Nicholas Greek Catholic Church, #10 First Presbyterian Church. Isn’t #14 the USS Offices? too cute Dennis but oh so right on ! 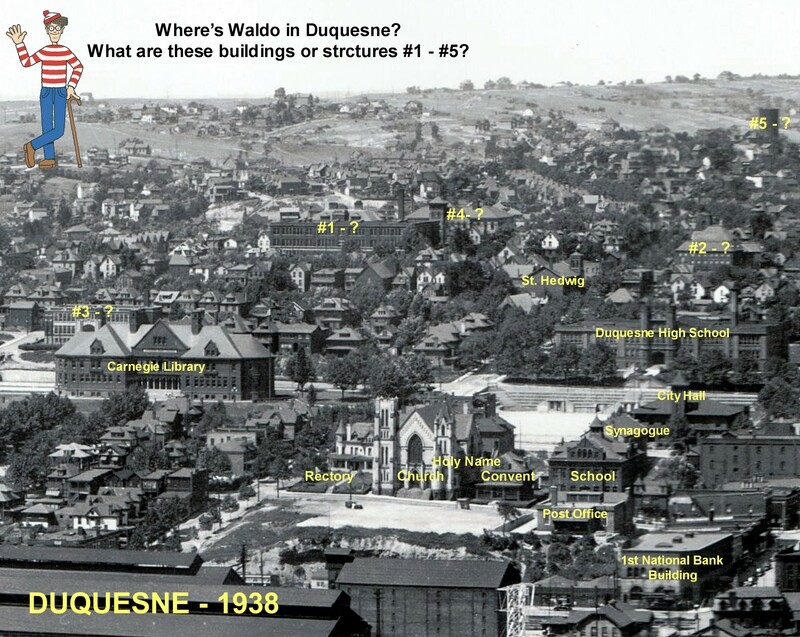 These pictures show at one time Duquesne had a lot of buildings. 11 is Camp grill, 12 became the mills parking lot, 13 was a apartment bldg across from Shragers Market, 14 Duquesne Works main office and engineering, 16 I think is Oliver School. The building #16 was Oliver School on 2nd Street. I have no idea what grades used the school. OMG, those photos are a fantastic treat! I’ll be exploring them in detail for the rest of the Summer. Great fun! I esp. like how we can see along the trolley line right into Duquesne Place, and that the photographer’s vantage points/perspectives are from along and above the river, a place where few of us ever explored, I believe. Our perspective, while living our lives, would have been from inside Duquesne, kind of like looking or walking down Grant Ave. or standing at Holy Name rather than seeing our hometown from the outside looking inward. The photos of a time and of places long gone by make me wonder where it all went. #19 is the uss steel cindering plant. Hi Jake, hope you are doing well..Sad note..Joe Duffy passed away last year. Not too many of your teammates are left.. I only lived in Duquesne for five or so years with my grandparents who were Slovak and who lived there all their lives (on Belmont) after emigrating from the old country. Their Names were Peter and Mary Smetana and they were Holy Trinity parishoners. 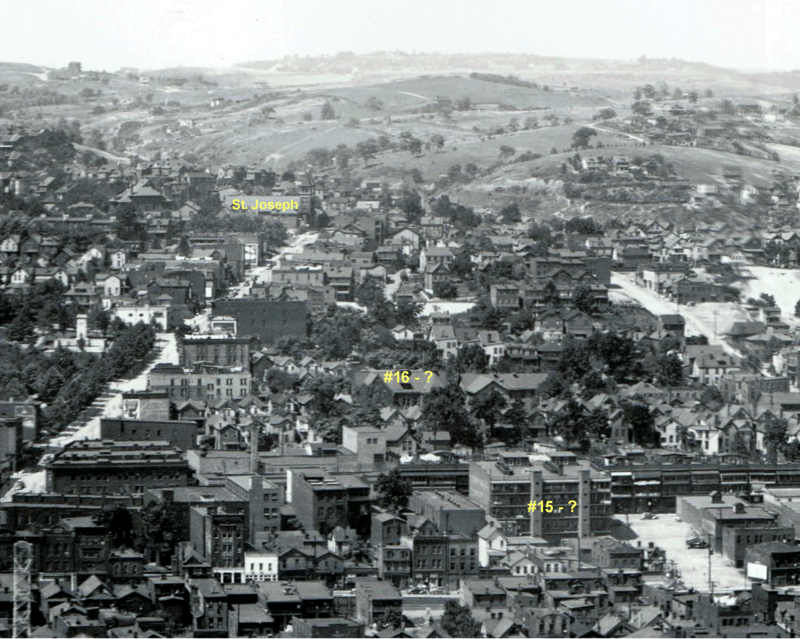 The buildings in the pic appear to be Libengood Elementary School #4 and the Junior High School #1 across from it. I am 86 years old, and went to Holy Name for catechism classes, for First Communion and Confirmation. We vacationed every summer in Duquesne, so I have fond memories of it. We lived on Polish Hill ( don’t know what it is called now ) and I remember walking all the way downtown (down all those wooden steps) to the postoffice for the mail. I loved Duquesne and the hikes and picnics we took with friends to Gypsy Hill…it looks from Google Earth to be all inhabited now. My father was a Slovak from Uniontown PA, and met my mom when she was 17 and he was visiting Duquesne with a friend. I am the family genealogist and am attempting to write a family story. Enjoy your blog immensely. Thanks! # 3 is Holy Trinity School – Attended 1949 to 1956. # Taking a guess # 6 is Crawford School -attended Kindergarten – l948, # 15 is apt. building. Two of my Boy Scout troop lived in that building. #15 was an apartment building on 1st. street. You are looking at the rear of the building. The two towers enclosed staircases. I delivered newspapers in that building and climbed the stairs from floor to floor while keeping an eye out for the rats – was always happy to get out of there. The empty lot to the right of the building in the picture was where a Firestone tire store was eventually built. Did you notice the traffic circle where 1st, 2nd and 3rd streets converged at the end of the bridge that went over the Union Railroad tracks and the Nick Lee Hollow creek? Your experience delivering papers at the apartment building sounds very exciting! I looked up the approximate address in the 1940 US Federal Census. That building would have been 51 North First Street and had about 12 families living there at that time, but thanks for explaining the two towers. I am also extremely happy that you pointed out the traffic circle. 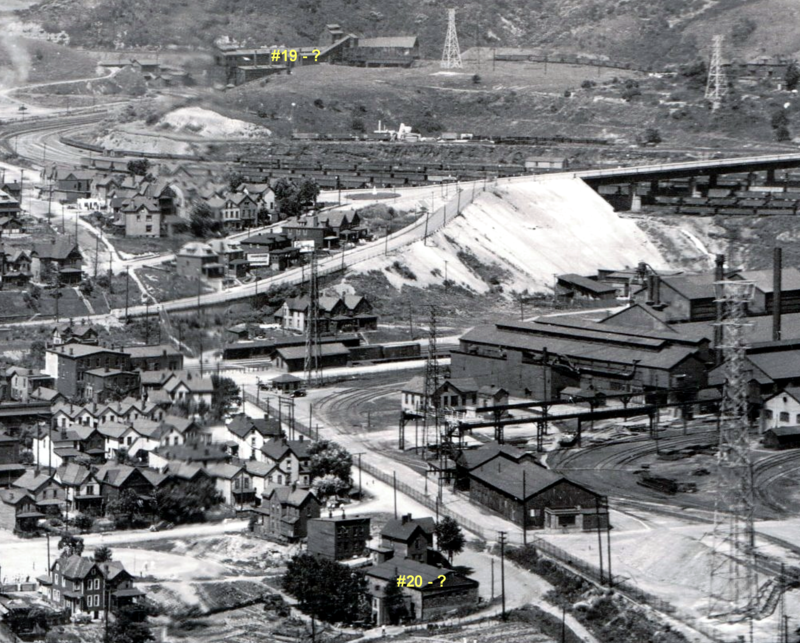 My dad lived at the top of N. First St. after the mill expansion and talks about playing at that circle all the time. It is great to be able to see these places for ourselves. Easier to attach a visual to the stories. If hope you’re correct on the spelling because I never really knew how to spell Nick Lee? The Junior High was on South Sixth Street and should be #1, with the grade school directly across the street. There were 2 elementary schools across the street from the Jr. Hi., Kennedy was older and to the left (facing) Libengood. My grandmother Dolly Dubois (late Lou Dubois were both from down below. my best friend Jim Bates who still lives in Duquesne right by St. Peter and Paul. His grandfather was from down below the tracks. And his grandfather was telling us how they wheel barreled the old house to up by St. Peter and Paul when he was a kid. They did this when they built the open-hearth furnace at the mill. And the open-hearth furnace is clear as day in the picture! I only know what the open hearth and everything about the mills becuase of my family all worked in them. Plus I did my own research becuase I’m a history major. My grandmother might be able to give insight on these photos. If I had to guess what 5 is. It’s the water tower like stated before or it’s the incinerator for the city of Duquesne. Where McKee asphalt is today. Kennedy Avenue 2 blocks from Mifflin Street and the Duquesne / West Mifflin border. There was a basketball hoop there and Steve, Paul I and others used to shoot hoops there. from the tower. That street ran parallel to Kennedy Avenue from Mifflin Street to Doney Street. I grew up right across the street from the Belback’s on Dell. I knew the Szuch’s also. A early friend of mine, George Sepal’s grandmother lived in your house before you. Maybe you were related? I knew Stanley, but he was younger and 5 years in those days was a lot!! It is a small world. Wow! My grandparents bought 1416 Kennedy in 1925. My mother was only 2 but had 4 older brothers. I’m sure the house was built around 1900. Never heard of the Sepal’s. The family name was Kukta, Both grandparents were from Hungary. The last one to leave the house was my Uncle Bill in 1995. So it was in the Kukta family for 70 years. at those younger ages. I remember a guy about your age who lived somewhere up at the top of Dell or Highland. He always drove down Dell and worked at the soda fountain of the drug store that was on the far left side of the Kroger center. May you know who I mean. Ray Krise, Ken Mowry, Chuck Teighhart, Sonny Butkin, and others on Doney St all played up there. Sad to see they tore that hoop down quite a few years ago. Debreczeni (later Debb) who lived between the old guy and Sonny. How time flies. That was Mike Herder(?) who lived there. A nice old guy who gave the best Halloween treats. Used to sit on his back porch and drink beer. I remember the Debreczeni’s also. I graduated in ’62 and pretty much never lived there again. I grew up on Dell st. Did you know Elaine Teichart? No. I presume she’s related to the funeral home? Mike Herder, yeah, sounds familiar. I lived at the corner of Kennedy and Dell. 1416 Kennedy Ave. Old Mrs. Kozak lived on the other corner in front of the Szuch family. Knew Stanley Belback up at the top left side of Dell. We both went to Serra HS. He graduated in ’65 and I in ’67. Small world. Also got haircuts at Tom the barber at the corner of Mifflin and Kennedy (entrance off the alley). Shopped at Kroger’s, ate ice cream at the drug store on the corner near Kroger’s or Hilltop Dairy. at Valco’s for $1.00 an hour at age 12-14? Denny, the cleaners was Plastino’s. So I am a little late to this party. I am Stan’s son. I actually got my first haircut as a kid from Tom during a visit from Virginia. My Grandmother was still at Dell street until last year. She had to move to assisted living. My dad had good stories from back in his childhood days. Didn’t your dad drive a bus for Serra Catholic ? Denny, misread your note and it was the house right below Szuch’s. So you were across the street. My mother worked at Kopriver’s greenhouse in the 60’s and early 70’s. A guess for number 5 is the water tower as said before or city of Duquesne’s incinerator where McKee asphalt is now. My grandmother and my friends grandfather might know these old structures. My grandma Dolly Dubois (late Lou Dubois). They all were relocated in Duquesne when they built the Open-hearth down the mill. The open-hearth is clear as day in that picture. My buddy Jim Bates who lives in Duquesne his grandfather was telling this story last year how they had wheel barrel the old house from down Below the tracks up by St. Peter and Paul. #3 is Holy Trinity School. I went therefrom 1st thru 8th grades. Yes, #3 is HTES and #8 is the church. I think #6 is Crawford school and #8 could be the old Holy Trinity church. #19 – I believe this structure is a “sintering” (spelling ?) plant that was located down along the railroad tracks below the West Mifflin-Polish Hill Playground , which was located on Edgewood Avenue , not very far from the Duquesne / West Mifflin border (Belmont Ave.) . . . I remember walking down and crossing “The Pipes” to get to “The Bank” , where you could look down onto the railroad tracks , Thompson Run Creek , and also the sintering plant , which my Dad referred to (jokingly) as “The Paprika Plant” due to the red colored dust which poured out of the structure when it was producing its product (whatever that was). If I am not mistaken , it is still there , but I highly doubt that it is still functioning. I believe structure # 5 is the water tower which is still there . I think structure #19 is the former USS briquette plant. Might have had another function in 1938. Nice picture, taken a few years before my time. Thank you for publishing this. We had a lot back then. I think #2 might be the Jr. High School. I attended Libengood Elementary in first grade which was across the street .